A gentle soothing baby wash made with only pure natural ingredients. No parabens, no SLS, no alcohol, no synthetics, no nasties! 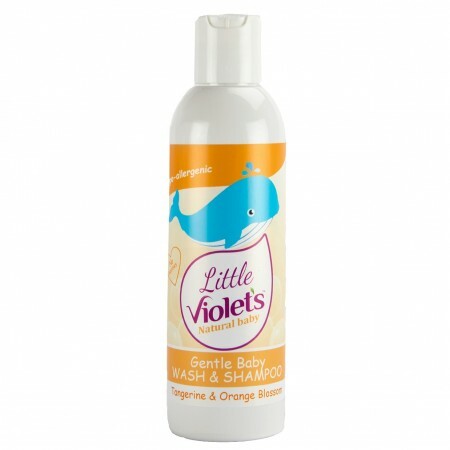 Perfect for cleaning baby's hair and body without stripping away natural oils or drying out their skin. This is a concentrated baby wash so you only need a small amount. The sugar beet creates a natural cleansing foam and the aloe vera & calendula nourish and protect delicate skin. No nasties! Little violet's 100% nautural toiletries and skincare for babies. A range of hand crafted pure and gentle products that you and your baby will love. All the ingredients are on the label, nothing hidden, nothing synthetic, Violet's know what's in their products because they make them by hand in Northumberland. We love the care and attention that goes into the Violets range and we use many of them in the Babi Pur household. Unequivocally no Parabens no SLS no Phosphates no Synthetic scents. Perfect for those looking for a natural alternative to common skincare products.